Mountain Breeze River Chalet – - can be your private retreat from the hustle and bustle of everyday life. Yearn for the peacefulness of the Shenandoah River? Searching for a secluded place for your honeymoon? How about a special anniversary get-away? Or, do you just need some relaxation time? 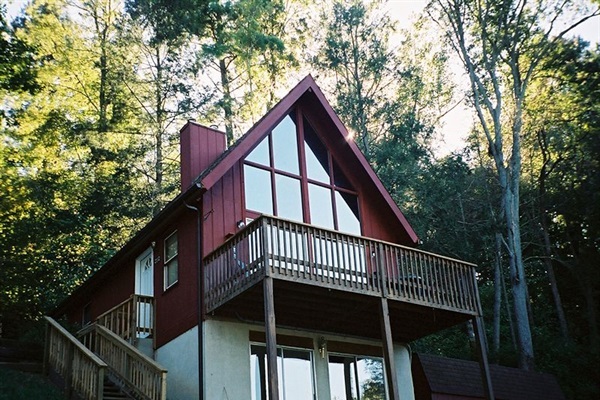 Our cabin is the PERFECT place to enjoy the beauty and splendor of the Blue Ridge Mountains and the Shenandoah River. Want to do some fishing? Visit nearby Blue Ridge Wineries? Relax in a hot tub under the stars? A double bed on the lower floor. We can accommodate 4 guests very comfortably. Please notify the owners of cancellation 30 days BEFORE date of reservation. If cancellation is done within 30 days of the reservation, a fee of 50% of the deposit will be charged. Smoking is not permitted in the cabin. Smoking outside ONLY. No candles are permitted due to fire hazard and insurance policy. Well behaved pets are permitted with a pet fee charged. Cleaning supplies are provided and chalet must be left in the condition you found it in when you arrived. When children are present, proper parental supervision is required at all times. Most important of all, relax, enjoy yourself and have FUN!